The endearing eastern barred bandicoot (Perameles gunni) is a small (640 grams) marsupial characterised by a slender, elongated head tapering to a pink nose and well whiskered muzzle. It has large, prominent ears. Its soft fur is greyish brown, while across the hindquarters are the characteristic pale bars or stripes that give the species its name. These easily distinguish it from the brown bandicoot, which lacks such strips. The belly, feet and short, thin tail are creamy white. In Tasmania, young are born between late May and December. During a single breeding season a female may produce 3-4 litters with a litter size of 1-4 young. Thus a female bandicoot can potentially give birth to as many as 16 young in one year! By way of comparison, rabbits give birth to between 11 and 25 young per year, depending on environmental conditions. Although the eastern barred bandicoot has a very high reproductive rate, mortality - particularly among juveniles - is extremely high. The causes of mortality are not well known, but predators and disease appear to be the main agents. The life-span of the eastern barred bandicoot is less than 3 years. Eastern barred bandicoots spend their day resting in nests. These are usually no more than a shallow depression in the ground with a dome of grass pulled over the top. Only one adult bandicoot occupies a nest, although young may share the nest with their mother for a week after they first leave the pouch. After dusk, they emerge and immediately begin foraging for food. Bandicoots are solitary animals and only mix with others when breeding. Barred bandicoots eat mainly invertebrates from the soil. They locate their food using their well developed sense of smell. Then they use their strong claws and pointed nose to dig small conical holes from which they extract food. Their favourite food items include root-eating grubs such as cockchafers and corbies. They also feed on beetles, earthworms, berries and fungi. 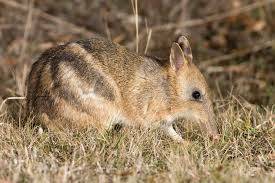 The eastern barred bandicoot is considered threatened because the species is potentially at risk of becoming extinct. This may seem surprising to many Tasmanians, as barred bandicoots are still common in parts the state. However, the eastern barred bandicoot is now extinct in South Australia and 'critically endangered' in Victoria, where the population has been reduced to a mere 200 individuals. Before Europeans arrived in Tasmania, the eastern barred bandicoot mainly lived in the native grasslands and grassy woodlands of the Midlands. These habitats were the first to be cleared for agriculture and grazing. The eastern barred bandicoot has now largely disappeared from the Midlands region. A similar process of large-scale clearing (as well as predation by introduced foxes) was also responsible for the drastic decline of this species on mainland Australia. Widespread clearing of remnant native bush, and also the removal of ground cover including some weeds, can convert prime barred bandicoot habitat into a wasteland in which the species cannot survive. This occurred over much of the Midlands. In the absence of foxes, selective clearing in Tasmania's southeast and north has provided suitable agricultural habitats for the barred bandicoot to colonise. These areas of improved pasture interspersed with patches of native bush are now the stronghold of the species in Tasmania. Barred bandicoots also use a variety of weeds, including European gorse and blackberries, as nesting sites and as a refuge from predators. Cats and dogs kill bandicoots, and may cause significant mortality in some populations. Cats carry the disease Toxoplasmosis, which can be transmitted to eastern barred bandicoots and is often fatal. We can reduce the impact of our pets on wildlife by keeping pets indoors at night. This stops them hunting when barred bandicoots are out feeding in the open. Preventing your dog from roaming means it has less opportunity to flush bandicoots from their nests during the day.